Photographer: Ellen von Unwerth. Model(s): Alek Wek. Source: Paper Magazine. Stylist: Adele Cany, Christian Cowan. Makeup: Kristina Vidic. Hair: Daniel Martin. 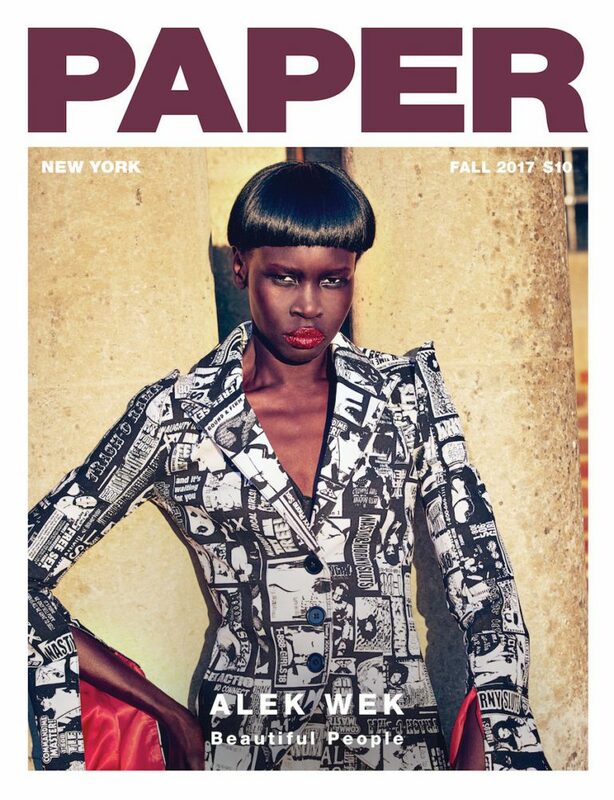 Alek Wek takes an evocative ride to the other side by Ellen von Unwerth, for Beautiful People Issue of Paper Magazine, Fall 2017. An artful revelation is set to fly as we embark on a trip to the center of the mind’s eye. Art and excess blend in a bouquet of riches, as images project a sense of sordid pleasure. Alek doesn’t hold back as she embraces this role with a kind of joie de vivre. Wrapping herself around the idea of nouveau riche’, she settles into the neighborhood of the obscenely wealthy. These styles speak to a vibe of synergism while still evoking an avant-garde edge. 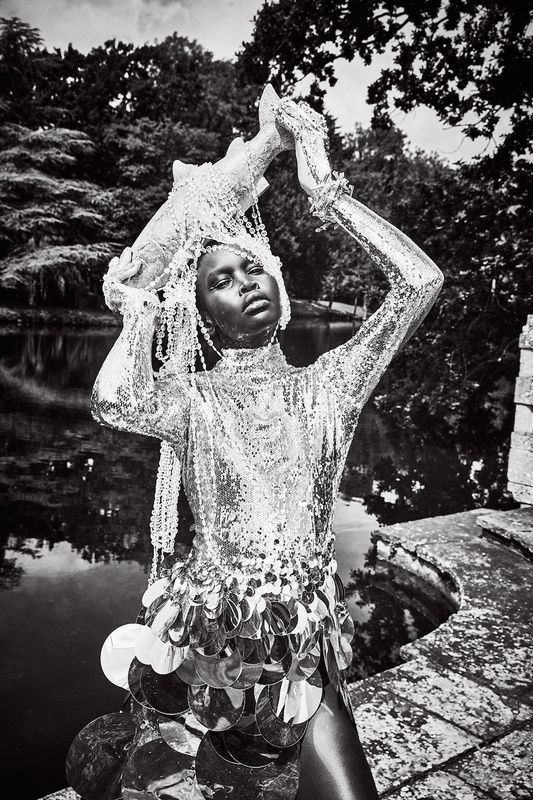 Water reflects off the dress as Alek stands in mirrored excellence. Metallic inspired designs graduate letting silver circles fall over the fabric. Dome shapes drip in disco decadence, as crystals cascade like hanging chandeliers. Depth is the concept by which we are aching subtly is the sanction by which we stand strong. Christian Cowan reflects on the playful side of parody with high designs that devour the page. Echoes of abstract poetry erupt, stating in no uncertain terms that this is a fashion freak show. Wek perks things up with pink, showing off a Chanel jacket/chaps that match with silk undies below. Chaos Meets Couture… as a huge, pepto-pink chapeau tops things off, while pearls wrap themselves around the body. She follows this picture with a provocative shot, standing in an elaborate doorway decked in divine designs. A red scarf is pulled around her face, as heart shapes follow the fabric as it falls to the floor. A furry, one-piece outfit matches the dog she is walking, while an large, leather belt mimics a masqued bodysuit she’s wearing. Adele Cany opens our minds as she explores the concept of couture. Blown out and beautiful, she walks through the garden wearing all white, with the castle walls reflecting off her gigantic hat. The drama of this piece plays to the spectacle of cinematic styles. So intoxicating is the imagery I find myself lost in the land of luxury. Beauty bares down as Kristina Vidic celebrates the shape of the face. Utilizing Wek’s wondrous facial structure, she’s able to systematically elevate every feature. That’s to say, this isn’t a tale of too much, rather it’s a journey of just enough. Vidic’s unique application allows the shadow to take a more smudged approach, with the dominance of dark lining the under eye area. A touch of gold tops the upper lid flowing seamlessly over the naked brows, as black busts out as it dusts below. Like a light being placed just beneath the skin so is the luminescence that invites us in. Powder glistens down the body beautiful as the shimmer invites the glow to ebb and flow. Red radiates in a heart like shape as pink punctuates with feminine power. Her glorious features heat up with full lips that project a sense of fire. Daniel Martin explores a variety of coiffured colors, from a powder-pink modified bob to a domed, black wig. A semblance of haute hair is artfully adorned seen in spectacular form. Our eyes move over her skin like a long, lost lover returning home.